When the wrath of Hurricane Sandy sent 14 feet of river water gushing through the streets on Manhattan’s East Side, one of the buildings to get damaged the most heavily was the VA Medical Center. As a result of the water damage, the federal facility remained closed for the next six months. But soon, as part of a $207 million hurricane repair and restoration project, the building will be protected from future flooding thanks to a wall that will be 14.5 feet tall at its highest point. 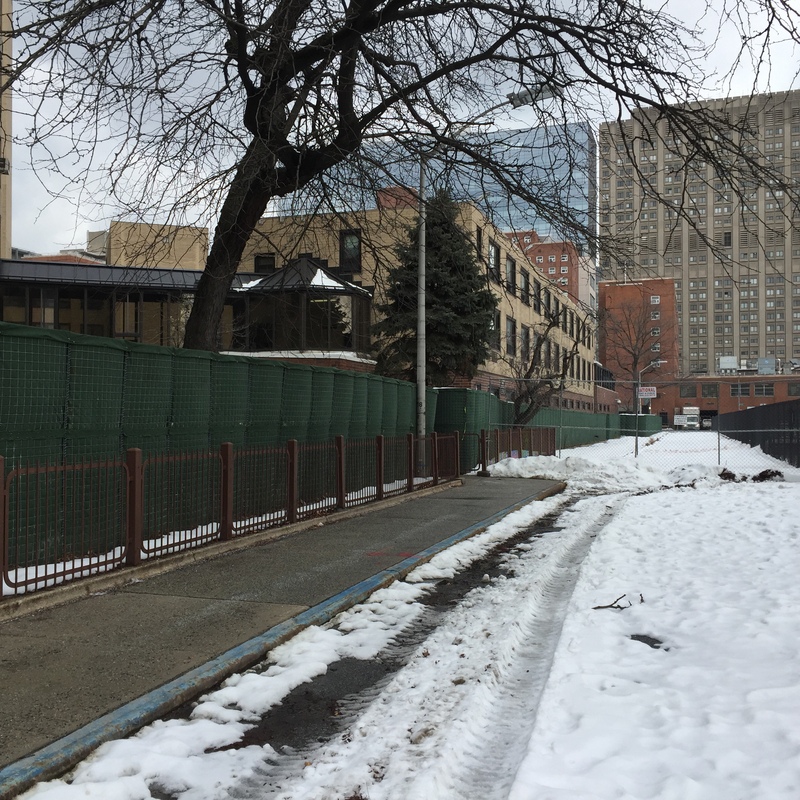 Preparations for the project have already begun with the placement of temporary fencing on the east side of the building by the new Asser Levy Playground and the closing of a parking lane on the north side of the property at 25th Street. Cement safety barriers will be going up this week to protect anyone in the vicinity of construction, with the heavy equipment for digging expected to be brought to the site in several weeks. Bozeman mentioned these details and others in an email to Janet Handal, the president of the Waterside Tenants Association, last week. This was after she reached out to the hospital with a host of questions when curious neighbors began noticing that areas were being fenced off. Seeing an official looking sign at 25th Street that declared there was no parking allowed, Handal at first contacted the DOT, where initially, “Nobody knew anything about it.” With a bit more digging though, she learned that it was all for the VA’s flood wall. Naturally, Handal’s concerns, along with the initial lack of communication from the hospital, were the usual neighborhood worries related to any major construction project, specifically excess noise and debris. Handal said she also wondered about the aesthetics of the wall, which she described as “fortress-like” after seeing the rendering, along with the expected removal of trees. The height of the wall, which was designed by a firm called HDR, will vary with the highest point being at the Asser Levy Playground. Although the wall will be 14.5 feet high it will appear to be 11.5 feet high due to the ground there being three feet elevated from the hospital. The wall will stretch around the hospital’s east side and go west three quarters of the block towards First Avenue on 23rd Street and the entire length of the block towards First Avenue on the 25th Street side. The wall will slope downwards towards First Avenue to about eight feet from the ground. At 23rd Street it will vary from 11 feet high to about four feet high at the hospital entrance to match the existing wall. The wall will also vary in thickness from eight inches to one foot and two inches though since it’s on VA property, it’s not expected to reduce the width of the surrounding sidewalk, Bozeman said. Funding for the wall was provided by federal allocations, the VA’s associate director of finance and information management, Jodie Jackson, said on Monday. Out of the $207 million that was given to the hospital, $23,830,000 is going towards the wall. Other restoration and improvement projects either ongoing or planned include moving the hospital’s generators to a higher floor, renovation of the entire ground floor and the building of a new sterilization processing area. Currently, the sterilization unit sits in a structure on the parking lot that’s connected to the hospital. As for the flood wall in particular, Jackson said the hospital’s administration, still smarting from the months-long closure, is “very anxious” to see that work get started. In the meantime, the hospital is finalizing details such as a contract for temporary nearby parking for its employees and figuring out what impacts there may be on anyone using the neighboring playground. Jackson admitted that at this time, she doesn’t know how much noise the project will create but doesn’t expect that any after-hours variances will be requested, with the bulk of the work being done during the day. A representative from the hospital was scheduled to speak about the project at a Community Board 6 Transportation Committee meeting on Monday evening, but that was postponed due to weather. The meeting will instead take place on Monday, February 9 at 7 p.m. at NYU Langone Medical Center, 550 First Avenue, Room 109. Sandro Sherrod, chair of CB6, said the board will be “working closely” with the VA on the project’s development. How much does this wall multiply the amount and strength of water flow that will be redirected down to and through Peter Cooper Village family’s homes in the case of another Hurricane Sandy? Shouldn’t engineers come up with a better solution before the feds approve and give money for this?